Pictured are council members Brandon Leeth and Adam Wilkin. Also pictured is council clerk Heather Collins. Pictured (l-r) are Hillsboro city council members Mary Stanforth, Claudia Klein, Ann Morris and Justin Harsha. AN ORDINANCE to make appropriations for current expenses and other expenditures of the city of Hillsboro, State of Ohio, during the fiscal year ending Dec. 31, 2019. Sec. 5 And the City Auditor is hereby authorized to draw his warrants on the City Treasurer for payments from any of the foregoing appropriations upon receiving proper certificates and vouchers therefore approved by the board of officers authorized by law to approve the same or an ordinance or resolution of council to make the expenditures; provided that no warrant shall be drawn or paid for salaries or wages except the persons employed by authority of and in accordance with law or ordinance. Provided, further, that the appropriation for Contingencies can only be expended upon approval of a two-thirds vote of Council for items of expense constituting a legal obligation against the city, and for the purposes other than those covered by the other specific appropriations herein made. Sec. 6 This ordinance shall take effect at the earliest period allowed by law. Along with discussing departmental budget cuts and proposing fee increases to offset the “very tight” budget, Hillsboro city council voted to approve the city’s 2019 budget ordinance during their Monday, Feb. 11 meeting. However, according to city safety and service director Mel McKenzie and Harsha, the city is looking at a projected carryover of roughly $215,000. McKenzie explained the budget, as well as the cuts made by various departments, during his report. McKenzie outlined those cuts as follows: $393,000 from the public works department; $220,000 from the Hillsboro police department; and $230,000 from the city administration. “In 33 years, a portion of the income tax was not specifically set for fire and rescue, as has been rumored,” McKenzie said. “To break it down to numbers, if the income tax were to be rolled back at 0.4 percent and it affected this year’s budget, we would have about $1.4 million less to run the city. This would be detrimental to the city and its ability to function. During his report, Harsha said that the finance committee held two meetings recently to review the budget, adding that “fire coverage was a big topic of discussion” at their first meeting. Harsha said the committee also discussed using building department fees to help offset expenses. As previously reported by the finance committee during council’s December 2018 meeting, “the permit fee is $35, and there is no inspection fee,” and the committee has been looking into implementing an inspection fee. During the committee’s second meeting, held Feb. 8, Harsha said they amended the proposed ordinance, which was “originally budgeted for a contract for four years for Paint Creek.” This “changes the need to budget savings from the real estate transaction at the end of 2022,” he said. Other budgetary concerns discussed by the committee were Liberty Park and some positions within the city, which may be looked into in the future, Harsha said. Harsha said that the estimated carryover is $215,329.05. Council member Ann Morris, who is also a member of the finance committee, suggested Monday that they hold monthly meetings “to discuss revenue options” and begin talks on the 2020 budget. Harsha said that they could make arrangements to do so. Hillsboro mayor Drew Hastings thanked McKenzie for his efforts with the budget and criticized Lewis for not attending Monday night’s meeting to discuss the legislation. Partially in response to the aforementioned budget cuts to the public works department, council heard the first reading of an ordinance to amend Section 51.36 of the City Code to provide for modification of the minimum usage charge for water usage. If approved, this would mark the second increase in a year, with council voting in May 2018 to increase the base charge for the first 133 cubic feet per month from $9.08 to $12.08. The ordinance presented Monday night would increase that price to $15.08 for the first 133 cubic feet as of the June 1, 2019 billing cycle. Brandon Leeth, who is the chair of the utilities committee, said he did not want to pass the ordinance as an emergency Monday “to give the public plenty of time” to learn about the ordinance. Leeth told council that his committee met recently to discuss the proposed water rate increase. Leeth said that according to the department’s annual report, there were 40 water main breaks in 2018, with each costing approximately $6,000. “Shawn also noted that the Ohio EPA wants communities to be able to set monies aside for future repairs,” Leeth said. “We have several water lines in Hillsboro that have surpassed the 50-year mark. Our water system is getting very old. “By adding a $3 base fee increase for the water department, the city expects to obtain approximately $97,000 for 12 months,” Leeth said. “There was a base increase last year, 2018, of $3, but the increase did not take effect until around September. Also related to the city budget ordinance, council voted 6-0 Monday to approve a resolution for the transfer of various funds for fiscal year 2019. During the mayor’s report, Hastings encouraged concerned citizens to “get involved” if they want to deter the building of additional dollar stores in the city. “I’ve had a number of people ask me about the new Dollar General store on South High Street, on 62 across from the elementary and middle school,” Hastings said. “People think we have too many of these type of stores already. Personally, I think that’s true. Hastings also told council that the Ohio Valley Regional Development Commission (OVRDC) held its county caucus last week and that “they are involved in a lot of infrastructure programs” locally. “I bring that up only because if you want to get a little bigger picture of what goes on at county meetings and beyond, we can always get you OVRDC information,” Hastings told council. 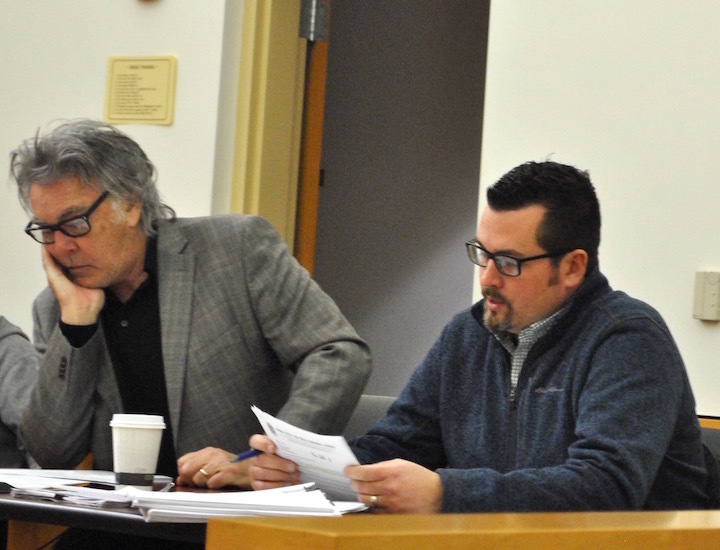 In the Hillsboro planning commission report, Hastings reported that Tom Eichinger and Charlie Guarino were re-elected commission chair and vice chair, respectively, during their organizational meeting. The commission has continued discussions of the city’s master plan through the Imagine Hillsboro project, with a new survey available for citizens to consider. The planning commission also conducted a public hearing on conditional use permit request for a West Pleasant Street property, which was not approved. “I thought it was a really good exercise in seeing your neighborhood – wherever your neighborhood happens to be – how you can get involved and encourage things to happen or stop things from happening that you don’t want to see in your neighborhood,” Hastings said, referencing dollar stores for a second time. The Board of Zoning Appeals also approved a sign variance for StandardAero, according to the mayor. “We need to allocate money to this project not only to pay for what we need now, but also to consider what it will take to set back and replace and repair the storm sewer lines in the years to come,” Leeth said. The city has received principal forgiveness monies to fund the first phase of the project, slated to begin this fall, he added. Leeth also asked for the official removal of the legislation proposing uniform citywide trash service – which received negative feedback from citizens and area trash service providers when it was presented in October 2018 – from the committee’s agenda. “There’s nothing that we can do. The ordinance states that it’s up to the safety and service director to make any recommendations on any sort of trash pickup,” he said. Street and safety committee chair Adam Wilkin reported that his committee has begun talks to revise the city code of ordinances “to add and/or remove any new or redundant legislation from previous years.” Wilkin said this was last completed in 2014. There was no discussion of the legislation in open session, other than the unanimous vote. In other action, council voted to suspend the three-reading rule and to approve an adopt an ordinance declaring improvements to parcels of real property located in the City of Hillsboro, Ohio to be a public purpose under Section 5709.40 of the Ohio Revised Code, exempting such improvements from real property taxation and establishing a tax increment fund (TIF). The ordinance affects property owned by CD DG Hillsboro LLC, located at 397 US Route 62. The legislation had its first reading in January. 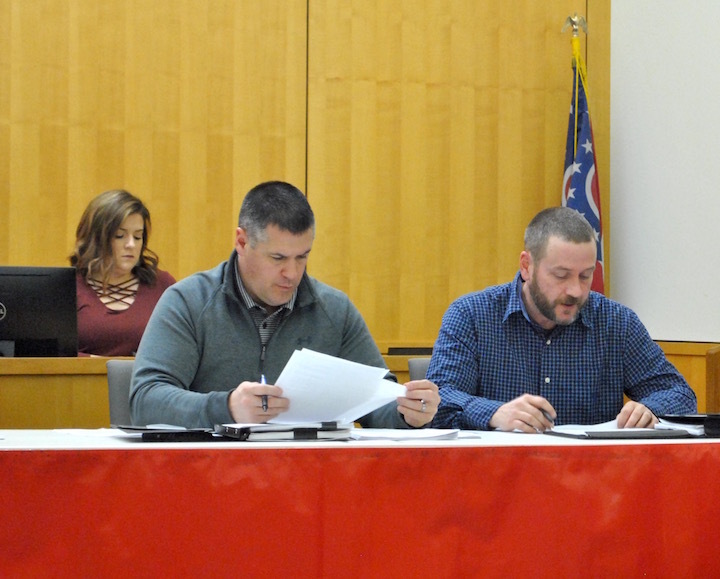 • Council voted to suspend the three-reading rule and to approve and adopt a resolution authorizing participation in the Ohio Department of Transportation Winter Contract for road salt. At the beginning of the meeting, council voted to excuse the absences of council president Lee Koogler, whom president pro tempore Harsha said was in the hospital, and council member Wendy Culbreath, whom Harsha said was recovering from an accident. Also during the meeting, council Claudia Klein asked if standing committees could stop hosting meetings in the upstairs conference room at the city building, as Klein said she’s been unable to attend recent meetings because she could not climb stairs for medical reasons. McKenzie suggested reserving the basement meeting room at the county administration building. Harsha said that if Klein had let him know before Monday, he would have switched the location of the finance committee meetings. So the lame duck Mayor is critical of the attendance of the City Auditor, Gay Lewis, who has accepted a new position in Greenfield. How about posting on the city website the attendance of every city official since Hastings took office. Rumor is the Mayor does not attend every meeting. Then this "Hastings said. “Our city auditor – I had wanted to bring the budget up to him, this particular budget, but he’s missing again [from the council meeting] for the fourth or fifth month. I would hope that whoever comes into that job, I would hope that council lays out what they expect of him – a little higher standard of reporting than what’s been provided.” As Mayor, over almost two terms, a little late raising this issue. You do work in the same city building as I understand it. And repeatedly, it has been reported, if you (the outgoing Mayor) and council want additional reports, you submit the request to Council President Lee Koogler, who in turn submits said request to Gary Lewis. Also recently it was determined your handpicked SSD was not always in attendance. Double standard? This comment has been hidden due to low approval. DD, you came into this comment section hot on the idea that people who disagreed with you needed to get educated but probably wouldn't because that would "require some effort rather than reading some half truths". Your literal first comment here was an ad hominem generalization about the intelligence and effort of anyone who disagreed with your position, not some sage clarion call for compromise and finding a middle ground. But then once someone comes and disputes your position with actual citations from the City Code, you immediately jump back on your heels and are acting like you've been attacked and you just wanted to find a sensible friendly middle ground all along. That's a tactic, not a position. This comment has been hidden due to low approval. Congratulations Consider you have just explained the government process of Hillsboro City Council! If you don't want to contend with the people that elected you, just pass the buck. Yes council is elected however, the SSD position is appointed by the Mayor therefore, this SSD will conform to the wishes of the Mayor otherwise, he will join the two past SSD's. The only way to change all this is to vote in a government system like Greenfield. With the number of R's in the city it will never pass if placed on the ballot. This comment has been hidden due to low approval. Consider, I hope you are a citizen of Hillsboro so you can run for office because clearly you have all the answers. This is why I rarely comment on an thread. Your comments are just an example of what is predominantly wrong with the Democrats and Republicans. I do not understand why grown people cannot accept the fact that others do not have to think the same as them but if you talk out problems 99% of the time a middle ground can be reached. This comment has been hidden due to low approval. Most amusing in this article is the mayor who wanted to run for city auditor needed the help of his sidekick ssd with the budget, while condemning the real city auditor, lol. I said there was going to be payback. Gary Lewis, say my name, lol. This comment has been hidden due to low approval. It sounds like you guys are essentially saying "Because different people come to different interpretations on things, legislative bodies should just always defer to administrative bodies where there is any sense of confusion". Which I believe is the polar opposite of the way that our nation's founders designed our system of government and is a massive cop-out. We are supposed have a system of checks and balances but with most power lying in the legislative authorities. Individuals like the safety-service director are only indirectly controlled by the voting public...members of City Council are directly elected representatives. The only limitations that exist on what rules and stipulations the legislative body can implement are the explicit limitations on municipalities found in the Ohio Revised Code or case law determinations made by the courts. If the members of City Council feel that 92.09 is a "grey area" or "unclear", they and they alone have the power to change it and clarify it. That is a much more responsible decision than throwing up their hands and saying "Ah well, up to the unelected SSD because of one lazy interpretation of a piece of code from 1963, what can I do?" •••••Editor's note: Then there's the old answer to the legal question of what does the ORC mean: What do you want it to mean? This comment has been hidden due to low approval. The U.S. Supreme Court can tell a President that his actions are not allowed by the Constitution. It can tell Congress that a law it passed violated the U.S. Constitution and is, therefore, no longer a law. It can also tell the government of a state that one of its laws breaks a rule in the Constitution. The Supreme Court is the final judge in all cases involving laws of Congress, and the highest law of all — the Constitution. Going back to my prior post, this also may be open to interpretation. ••••Editor's note: Especially the part about the "highest law of all." This comment has been hidden due to low approval. Consider, I’m not disputing your interpretation of the other sections of Chapter 92. I don’t personally read it the same way you do but that only bolsters DJ’s statement of 10 different lawyers, 10 different opinions. Again, I’m not a lawyer nor pretend to be. This comment has been hidden due to low approval. When did the U.S. Supreme Court gain legislative powers? I must have been asleep and missed something. This comment has been hidden due to low approval. I think anybody would have to agree with D.D. The verbiage used in any document is open to interpretation (ie. The Bible, Constitution, laws written by the US Supreme Court). If council members have questions with the ORC, city ordinances or resolutions they are supposed to seek the advice of the city law director. As an attorney told me, if you give a paragraph for an opinion to ten different attorneys you will get ten different answers. This comment has been hidden due to low approval.